Over the years, Bali has grown from a typical tropical tourist destination to one of the hottest items on the bucket list for many people around the world, including whoever you are reading this post too perhaps. As you consider actually visiting Bali and ticking it off your summer (or lifetime) bucket list, you’re also probably wondering on where you should stay when you are on the island. With its current status as a superstar destination for travelers, there are literally thousands of hotels, B&Bs, hostels, bungalows, and villas for your choices of accommodation on the island. And perhaps you start to wonder – which one’s the best? I’ve had the privilege of visiting Bali 7 times so far and have explored various areas of the island and with that, have stayed at some of the best and worst accommodations that Bali has to offer. Here are my 5 favorite places to stay in Bali scattered in various parts of the island. My family and I arrived at this hotel at the ungodly hour of 2 AM – one of those hours in which one would typically be mad about meeting people, let alone having to serve them. Yet when we checked in at Grandmas Plus Hotel Legian, we found no rudeness of any sort from the hotel staff at the front desk. Those smiles were tired, but genuine and I appreciate that a lot after a long day of dealing with angry people at the airport. The hotel itself is minimalist and it’s clear that it’s one of those hotels only meant to sleep in. The rooms were small, but not too compressed and were all stylish as well as clean. However, it was when I woke up the next day that I discovered its main strength as a hotel: location. Grandmas Plus Hotel Legian is located at the hub of one of the most strategic intersections in Legian. Just by crossing the street and walking a couple hundred meters, you’ll find yourself among rows of Legian’s shops, Legian Art Market, some great food and Legian Beach itself. However, it definitely didn’t seem like so at night given how quiet it was save for the sounds of a couple of cars passing by. If you’re just stopping by the southern part of Bali or thinking of staying there a couple of nights more but spending most of your time exploring, I would definitely recommend this place. Also, if you’re arriving at Bali horribly late at night but want to stay somewhere strategic instead of near the airport, this would be the place for you. I wish I’d stayed longer than one night there given the location and the staff’s friendliness so I hope that you would. Tip: if you’re trying to find the hotel late at night, make sure you know exactly where the location is because the sign displaying the name is on another side of the building that you won’t notice at first. Although my stay in this villa was quite a long way back, apparently the villa’s only gotten better in time so I decided to include it here. If you’re traveling with your family and close friends, you’re going to love this villa because it’s quite like having your own two-bedroom apartment for vacation. Located in the middle of a residential area in Denpasar, the location is extremely quiet and private, which was not that big of a problem at all when the staff are friendly and you’ve got a great swimming pool inside. One of my favorite things about the villa is definitely how spacious it is even though it looks pretty small from the outside. You walk into the two-bedroom suite and you’ll find a huge living room with the master bedroom and bathroom covered on the other side of the wall. Behind the living room is a little dining room and a kitchen space complete with pans and all that. Climb up the wooden staircase and you’ll find the second bedroom and bathroom with a TV installed in front of the beds. Definitely one of the places which utilizes space effectively while still looking expansive. The best part is that the staff members catered to our needs well. Breakfast is delivered every morning to the dining room at our suite. When we swam, towels were prepared on the side. It was truly like living in your own vacation home. Tip: at night, everyone arriving at the villa’s gates require to have their IDs or passports checked. It may be annoying when it happens, but in hindsight, I get that they’re trying to guarantee that the ones arriving to the villa at night actually stay there which is an extra measure of security. This homestay is definitely the most authentic local experience of hospitality I’ve ever had in Bali and quite easily the most value for money one too. For just IDR550.000 per night (*price applicable during my period of stay), you’ll get to stay at the huge two-bedroom, two-bathroom family room and get a breakfast of banana pancakes and fruit platters the next day. Insanely good price, I know! However, this super low price does not mean that the quality of the place itself is low. They keep all the rooms really clean and the hosts genuinely care about your needs and go out of their way to make you enjoy your stay. The family room consists of a huge (by huge here, I mean incredibly large) living room with a TV set and stacks of magazines and travel brochures, a kitchen with complete equipment, a fridge, a terrace space with dining area outside, two bedrooms with a wardrobe and towel rack each and a rustic bathroom in each bedroom with a sitting toilet and hot shower and you’ll have access to the little garden space in front of your door. Oh, have I mentioned that the place you’re staying in is actually part of a Balinese family’s home? The house is owned by Mr. Ketut and is located at the village of Pejeng, a couple of minutes away by car from Ubud. Although its location is really secluded since it’s quite literally in the middle of rice fields, he provides free transport service to the central area of Ubud and lends you one of his old Nokia phones for you to call him for a pickup from Ubud. He also provides menus from nearby restaurants which deliver to the homestay if you want to enjoy dinner back at the villa. He also offers some biking tours if you’re interested and on top of that, is a very polite and friendly guy. If you’re looking for the true local experience, this is definitely it as in the morning, you’ll find Mr. Ketut’s relatives praying and laying offerings to bless your room, watch the sun set over the rice fields just outside the homestay, shop at the local warung on the road in front of homestay and overall feel like you’re actually staying at a home in Bali. Tip: since part of Ume Sita is also the residence of Mr. Ketut and his family, you might hear some chatter at night as the family chill outside while drinking coffee. They’ll keep their voices down though and so should you. Also, even though Mr. Ketut will literally say “bother me with anything you need” when you arrive, please make sure to call for him at his residence in a polite manner. Although I’ve reviewed this villa before briefly, I feel the need to give a more expansive review because this is truly the definition of summer paradise for me which I still look back on and refer to whenever I talk about summers. Located at Nusa Lembongan Island, 1.5 hours off the southeast coast of Bali, Naturale Villas is within walking distance from the natural port at Jungutbatu. One of the villas’ friendly staff will pick you up and help you with luggage when you get to the island and guide you back to the villas. The villas itself is seriously the place with the most serious summer vibes I’ve ever stayed at. The entire common area of the villas which includes the dining area/lobby and the swimming pool with beanbags are open air with no walls and everywhere you look, the decor is vibrant and chill – as if summer rained over the entire area. The villas themselves were the perfect place to chill, especially if you pick the ones furthest from the lobby. My family and I picked the family hut which is entirely made of wood and is closest to the sea, meaning that one side of the villa is facing the sea separating Nusa Lembongan and Bali. Every minute you spend there, you’ll get to hear the waves of the ocean come crashing to the shore which is honestly super calming. The hut itself is filled with plenty of amenities. It consists of two bedrooms – one on the top floor, two bathrooms (one closed and the other open air and without roof giving you the experience of showering under a gazillion stars), and two living spaces. The bottom living space has beanbags and a bamboo swing for you to laze around in while the top living space has beanbags, a book case, and an iPod deck. All of these face the ocean on side. The staff members are nice too and one of them was super chatty while delivering our dinner which made our experience there all the more fun. If you’re looking for chill summer vibes, Naturale Villas is everything I would recommend for you. Tip: there aren’t plenty of options for food around the villas, but the room service options from the villa cooks are really nice. Also, the only way to get around Nusa Lembongan is by motorbike and you can rent it at this villa as well. 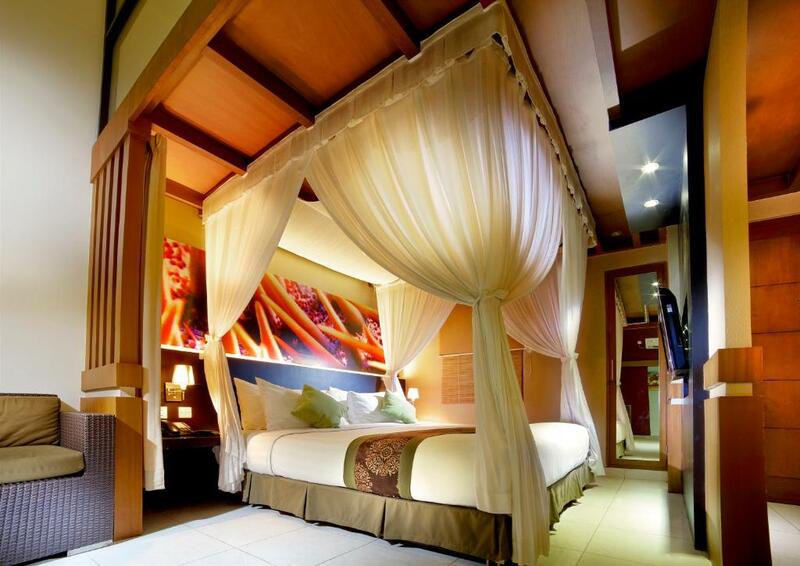 This one takes the trophy for being my creme de la creme of accommodations in Bali. Located in the more off-the-beaten-path but incredible Pemuteran, Biorock Homestay is owned by Mr. Komang Astika, a Dive Instructor and the technical director of Biorock Indonesia’s efforts in reef conservation. It is situated in an alley heading towards Biorock’s office at Pemuteran Beach and is just a 2-minute walk from the beach. The first thing you’ll notice upon entering the homestay area is the pristine garden. Seriously, that garden is the best manicured garden I’ve ever seen in all of Bali. It was such a clean garden that I would willingly go barefoot walking on the grass. It is when I woke up on the second day here that I discovered the secret – the staff members take good care to clean it every morning! The rooms in the homestay were also equally clean and each room consists of the bed, a small dining area, a terrace space with towel racks for drying off clothes and swimwear, an open-air bathroom with hot shower, and a wardrobe. All this and breakfast everyday for only IDR350.000 a night (*price applicable during my period of stay) makes it another value for money option for accommodation in Bali. What really made this homestay take the cake for me though is actually the people working in it. Lots of accommodations can brag about having friendly staff and having gone through plenty of them in Bali, I’ve seen a lot of these super nice staff too which is awesome. But at Biorock, you’ll feel like you’re with family. The kindness and warmth you receive from all of the staff are seriously genuine and most of the staff are still young. If you’re still within your 20s, my gosh, you’re going to have fun hanging out with them. Sandy, Eko, and Thomy were really cool guys to have a banter with and you’ll have fun keeping the conversation going with them. But the glue that binds them together is Mr. Komang. He’s a seriously good manager who cares about his staff and guests. He is super passionate about the ocean and swimming in it and really keen to share that passion with you. He even made me beat my own fear of deep water by giving me the best snorkeling lessons I’ve ever had – which was awesome because nothing tops Pemuteran’s marine biodiversity so far in my book. He genuinely cares about each guests – checking in with me after my first snorkel session without him to ask how it was and looking genuinely excited when I said I’ve fallen in love with the sea. His family is also around at the homestay a lot and they are super fun to hang out with. The neighborhood is also super friendly and there are some good eateries just outside the alley and available on-call for delivery. If I’m ever asked to mentioned my Balinese home, this would be it. If you’re a family or a group of young people looking to enjoy some chill eco-tourism and learn more about Bali’s marine life or experience a home away from home, this is where you need to stay. Tip: ask Mr. Komang about reef conservation efforts and how you can play your part in it. He will explain it to you in the most understandable and enthusiastic way and you’ll be more educated on the importance of coral reefs in preserving oceanic biodiversity as well as our own breathing! Although this doesn’t cover all of Bali’s many regions, my little list is basically the coolest places I’ve ever stayed at in and around Bali based on my experience and hopefully covers some areas you visit on the island. If you have any more recommendations on where to stay in Bali, let me know in the comments below for me to experience next time I’m on the island! Also, while we’re on the topic of preparing for your next trip, one of the things you should also think about preparing is travel insurance. Having good travel insurance can seriously help you out when the going gets tough and you need to pay for medical services or even cancellations of vacations. Rather than researching which insurance is the best, why not look at a site which has done that for you? Reviews.com has done an extensive (and by extensive, I mean it! Their methodology is insane!) research on which travel insurance is truly the best for you based on policies, financial strength, coverage, customer services, and insurance fees. You can check out their review here!